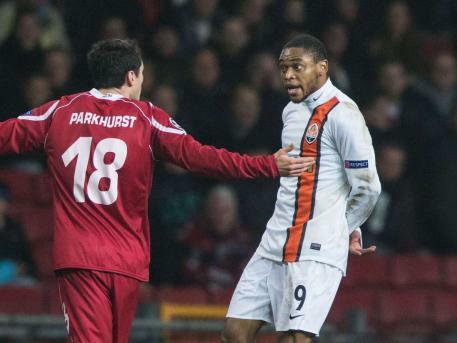 Before we get to some of the presser quotes about last night's FCN-Shakhtar to-do, I will pass on this annoying nugget: apparently Shakhtar captain Darijo Srna did verbally agree that they would allow the hosts to score a cancelling goal directly after Luiz Adriano's shady equalizer. And, it would seem, Shakhtar have no need for all the respect they've gained in recent years. Unreal. Naturally, UEFA is pretty much pretending it didn't happen on their website, which annoys me to no end. "I don't know if Shakhtar are bandits, but some of their players, bosses and coaches are without morals." "First and foremost it's the player's choice [to score a goal that way]. As coaches, we are forever on about respect for the game, the opponent and the rules. In my world, it's unsportsmanlike conduct and a red card for Luiz Adriano would have been quite appropriate." "I asked what happened. Adriano said: ‘It was instinct, I see the ball and I dribbled and I scored a goal'." "We wanted to let them score, there was big confusion in the team and they scored. They deserved to score, and after 2-1 we started to play football. It's a pity that this happened. I'm sorry." this whole situation reminds me a little of the hand of god. so maradonna scores with his hand for one goal, but the other goal he scores is goal of the 86 world cup and maybe goal of the century. its like ying and yang. the main thing is that you dont want to be on the receiving end of any of these events. Urgh... YIN and yang. For crying out loud, do you not watch Psych? you idiot, you misspelled maradona also. there is some back story here also. it appears that shakthar were agrieved in a similar fashion a couple years ago, by one barcalona. I'll give you a pass on Shakhtar as that's a toughie. yes, barca, thank you, sorry. the final bit of backstory also is directed at this game itself. im not sure if the player who scored danmarks first goal also was the one who went down, but i think he was. and it was adriano himself who was involved in that contact as well. so danmark is on the attack and one of their players goes down, and from my view, feigns injury, and the play is stopped and the deadball kick occurs. from this percpective, you can see how luis adriano would have no sympathy for the danish team, and so, they were sleeping and got punished. What nonsense. Luiz Adriano did that off an uncontested drop-ball, which he used to his advantage in skating right past the defenders. Then, Shakhtar apparently made an agreement to give the goal back, but instead tried another trick. It was hella-shady. back in the day, if a player went down, it was up to the team in possession to knock it out of bounds, then it was up to the team throwing in to give the ball back. now the official can stop the match if he feels the injury might be serious enough, or if it is a head injury. the drop ball was only uncontested because the danish side did not step up for the drop, which they had every right to do. Are you contractually obligated to be intentionally wrong? City ordinance? Seriously, what gives with the alternate realities?